The fixtures of the Quarterfinals were drawn on Monday 04 April 2011 in Vienna. Only eight teams remain in the 2010/11 VELUX EHF Men’s Champions League. They will meet in four Quarterfinals. The four winners of this knock-out stage will then directly qualify for the VELUX EHF FINAL4 in Cologne. 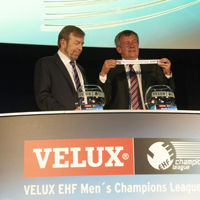 The draw for the 2010/11 VELUX EHF Men’s Champions League’s Quarterfinals was carried out on 04 April 2011 in Vienna by Tor Lian, EHF President and Michael Wiederer, EHF Secretary General. The first leg matches of the Quarterfinals will take place on 20 – 24 April 2011, the second leg matches are to be played on 27 April – 1 May 2011. The finalised schedule including detailed dates and playing times will be published in due time. Find more information on the 2010/11 VELUX EHF Men’s Champions League here.